You are currently browsing the tag archive for the ‘Creole Queen’ tag. 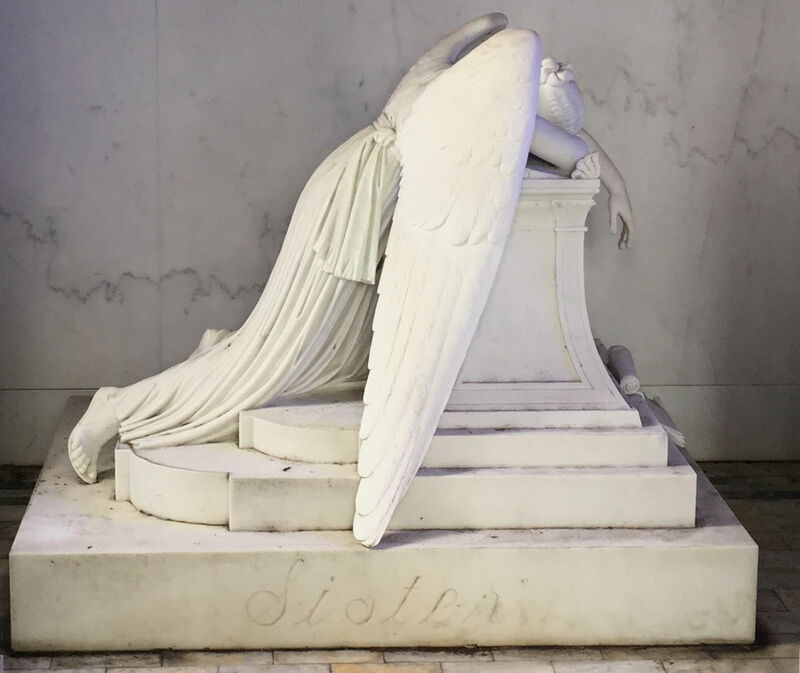 Statue of a weeping angel in the Chapman Hyman Tomb. Standing before the statue, I could feel the grief in my own body. I am one of the lucky few who got out again, after being shut up in a cemetery for the night. But let me start at the beginning. I’m in New Orleans for a quick trip with a friend. The trip was my idea. He loves the city and I’ve never seen it, so I wanted to be introduced through the eyes of someone who loves it, you know? Anyway, we arrived at night and on our first day out we both wanted to see cemeteries. 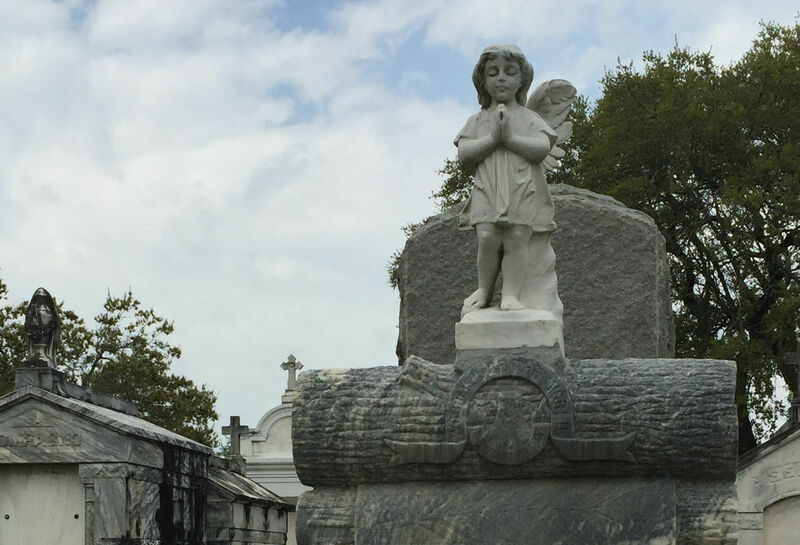 We went to Metairie Cemetery first. Built on the site of an old racetrack, some of the curved shape of the track can still be seen today. 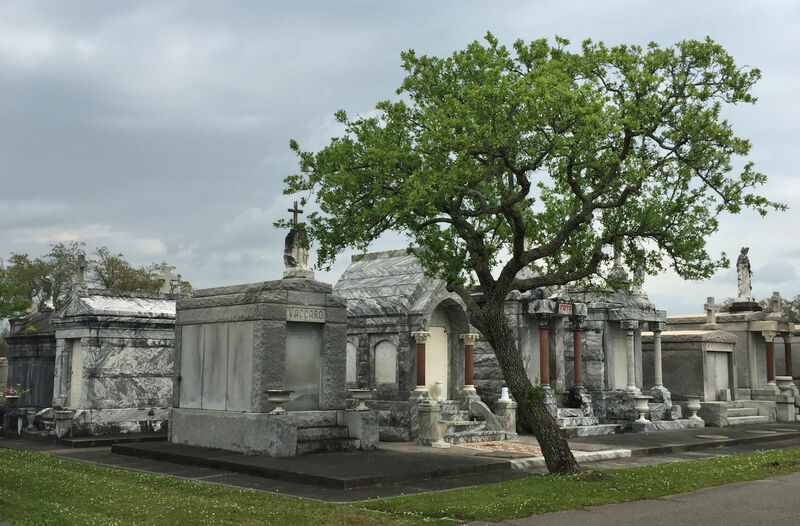 The cemetery is simply gorgeous, with white shining marble everywhere, manicured lawns and mature trees. Patrick wanted to see the weeping angel first, so we drove to it and parked the car. You can see my photo of her above. The expressiveness of the statue is heartbreaking, and the inscription “Sister” at the base brought tears to my eyes. Then we walked. And walked. The place is enormous! We didn’t really intend to walk around for two hours, but that is what happened. 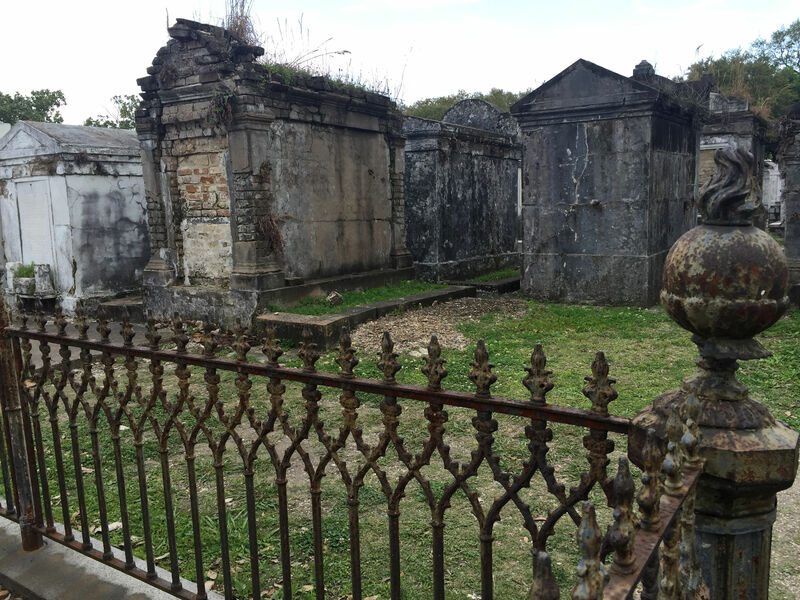 The city was founded in 1718 and people have been dying there ever since. As you know, half of the city of New Orleans is below sea level and protected with dikes and flood walls and massive water pump systems. It doesn’t take too much imagination to realize that you don’t want to bury your dead in the ground. So tombs are built on top of the ground. 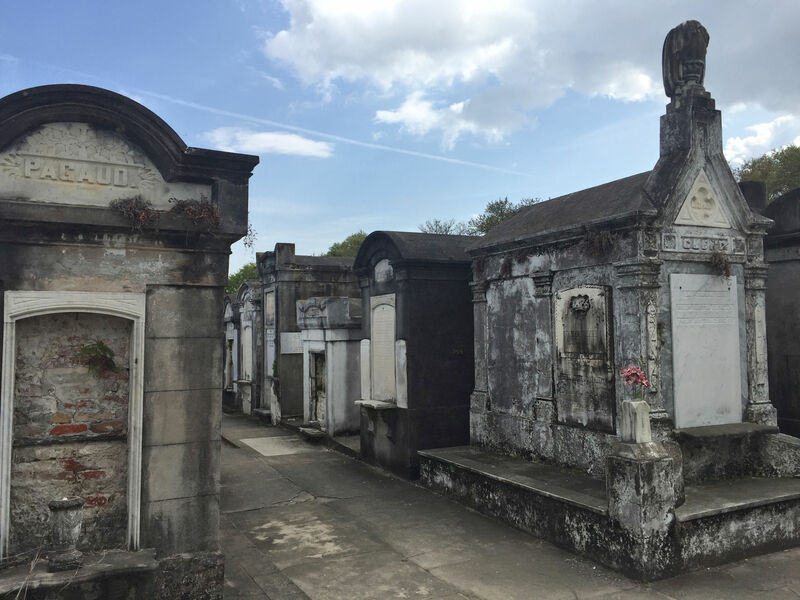 As we walked between them, the ground was often marshy beneath our feet and there were standing pools of water in low spots, reminding us that it is no myth: the city of New Orleans is level with the water table. 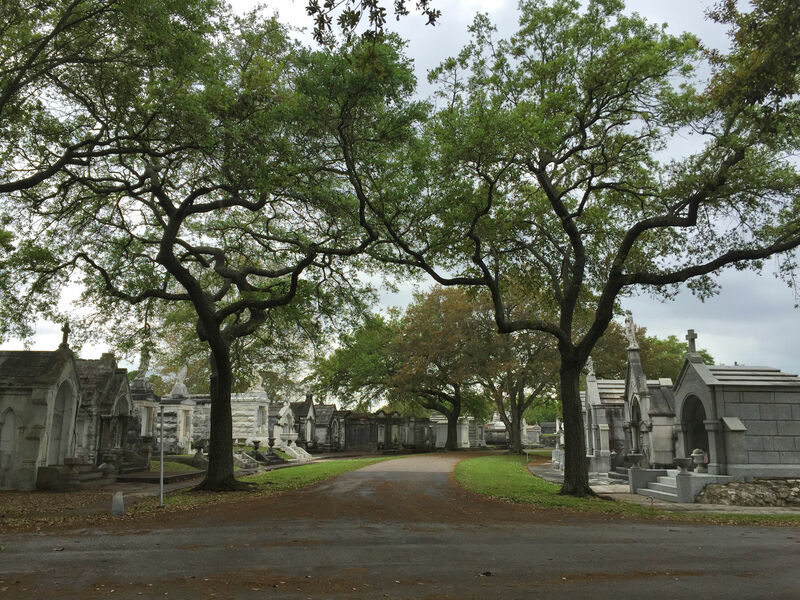 One of the tree-lined avenues at Metairie Cemetery. 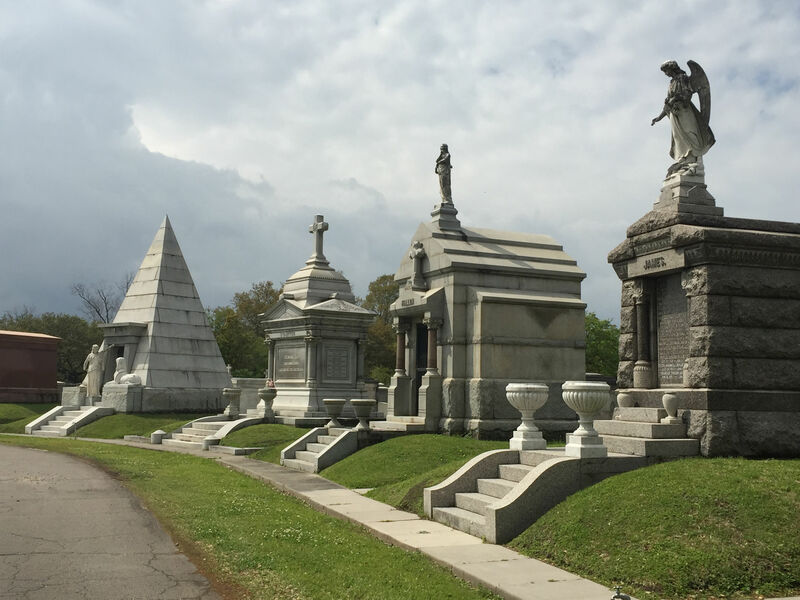 At this cemetery, tombs are not crowded. Many of the tombs are elaborate. The pyramid caught our eye. Parts of the cemetery were more congested, but still lovely. This panoramic view shows the arrangement of tombs along the avenues. Click for a larger version so you can see the detail. 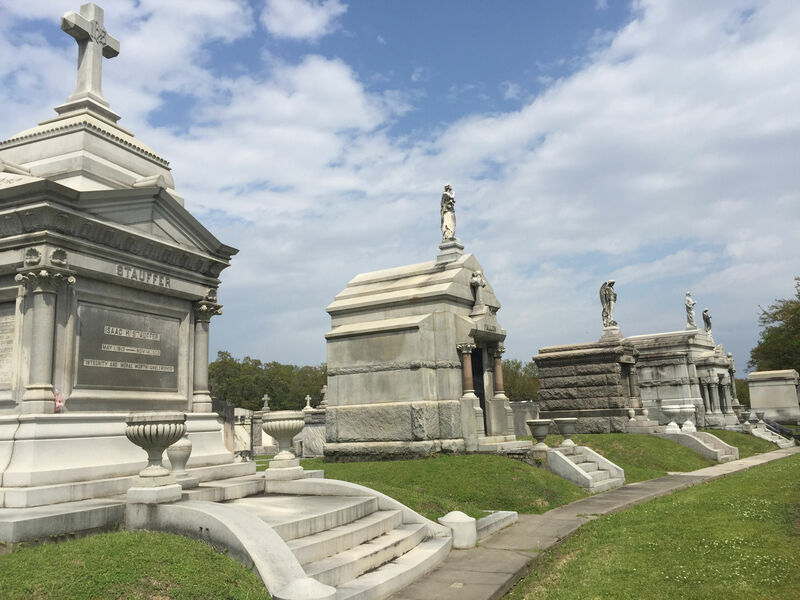 I was not able to show clearly this picturesque narrow row of tombs because I was trying to crop out a bunch of bright orange construction cones. Another row in the apparently more modern section. One of the many “Woodmen of the World” grave markers. Interesting aside: we noticed many Woodmen of the World markers on graves, with marble markers in the shape of logs. There were at least six styles of log markers that we noticed, and I became curious. Founded in 1890, Woodmen of the World is a fraternal benefit society. 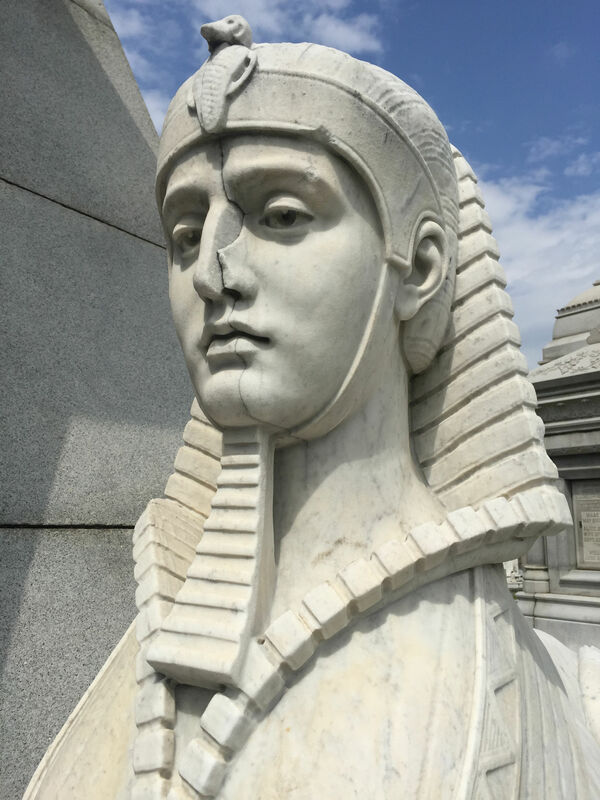 From 1890 to 1900, WOW’s life insurance policies had a proviso that provided for the grave markers, free of charge for members. 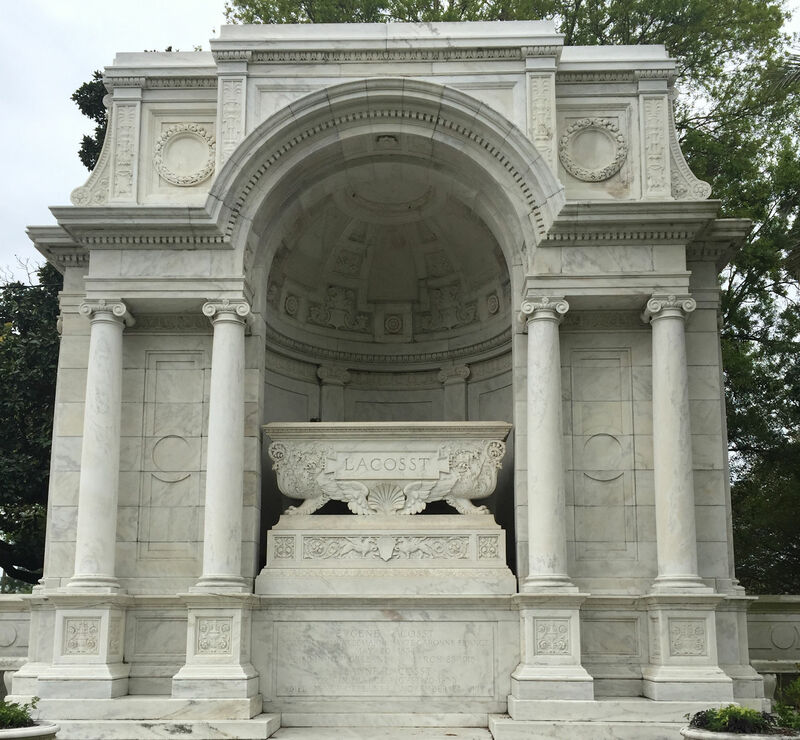 From 1900 to the mid- 1920’s, members purchased a $100 rider to cover the cost of the monument. Since then there have been no discounts for grave markers. As I was leaving, I turned back to look one last time, and saw this amazing sky casting an eerie light on the darkened scene below. I regret that my simple phone camera couldn’t duplicate how beautiful it truly was. 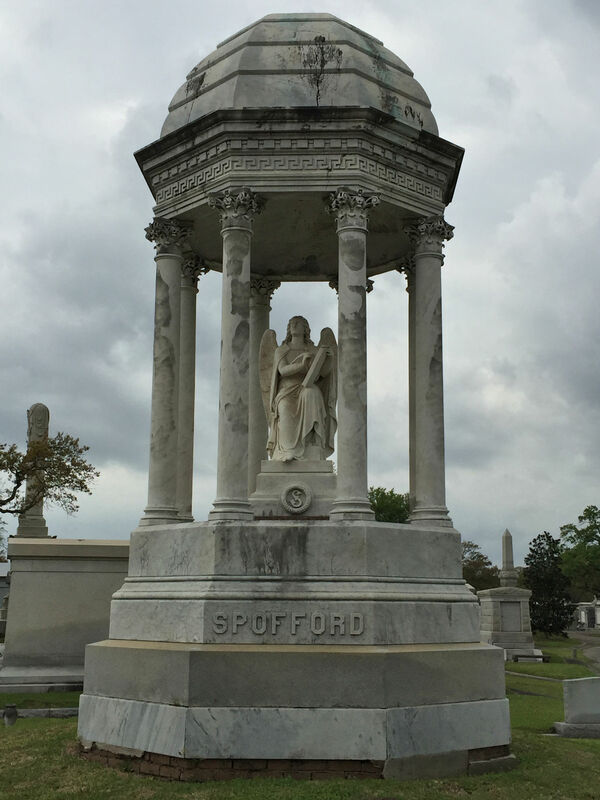 Next we went into the Garden District to Lafayette Cemetery No. 1. 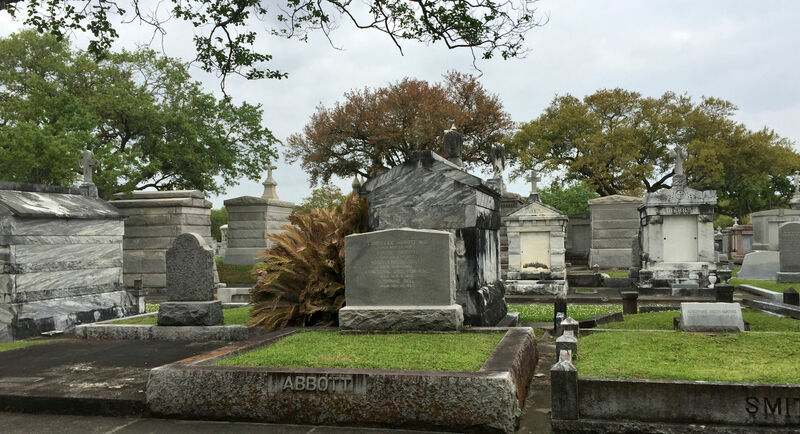 This one is famous because author Anne Rice used to live near it and based the tombs of the Mayfair Witches and the vampire Lestat on the tombs she found here. 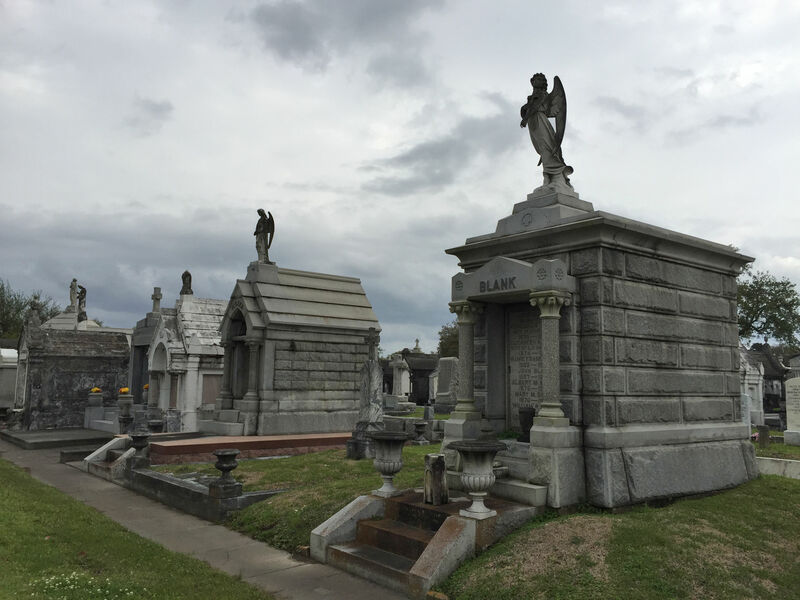 And consistent with that history, this cemetery was more what I anticipated in a New Orleans cemetery: not crumbling apart, but certainly a very old and storied place in the center of busy neighborhood streets. 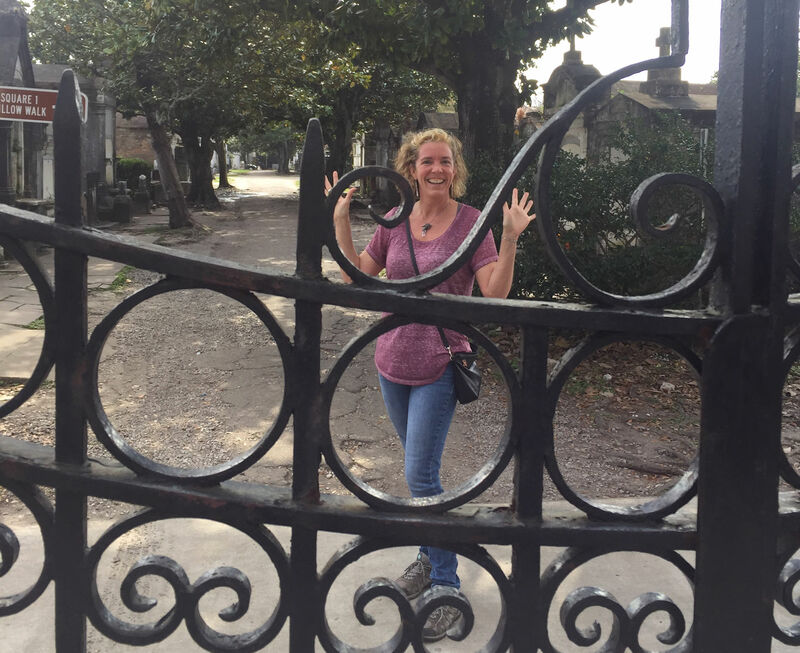 As we approached the front gate, there was a crowd encircling a tour guide, and other people milling about in every direction. 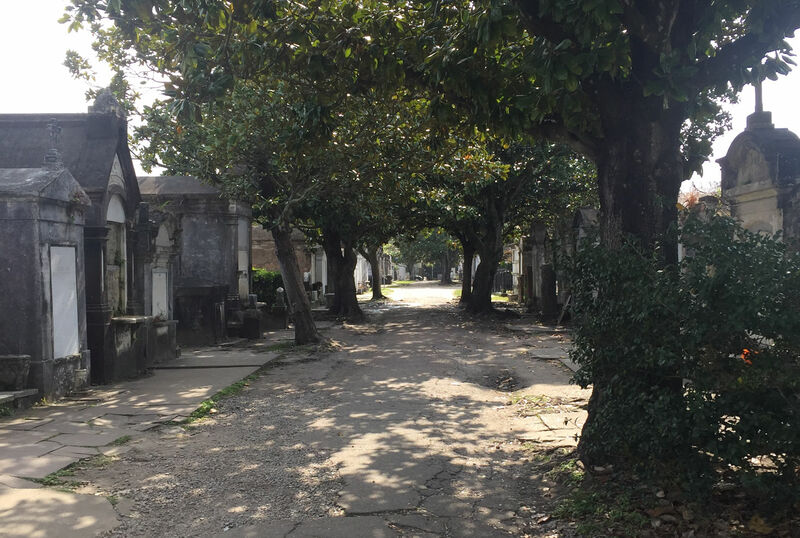 We slipped as quickly as we could through the tourists and between a row of tombs to begin our cemetery explorations in peace. We actively avoided all people while we were in there…which was likely the reason we did not hear the warning to get out. 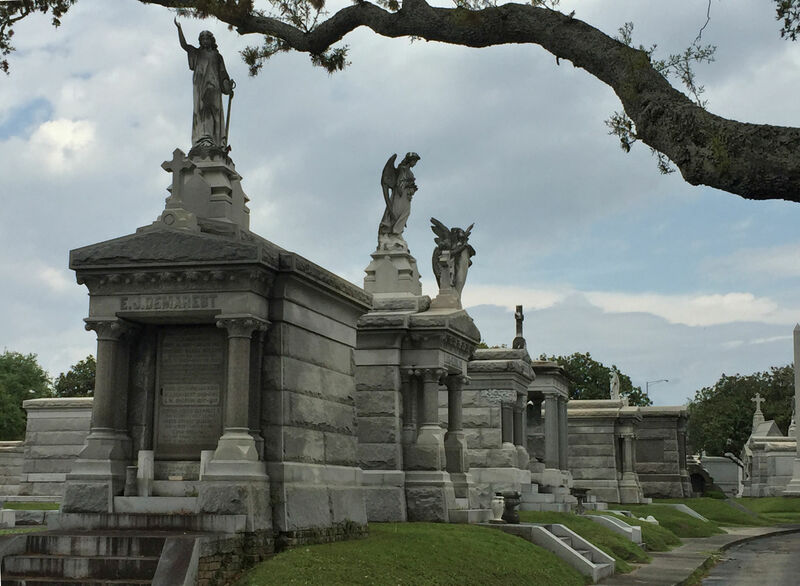 This is what I had in mind when I pictured a New Orleans cemetery. 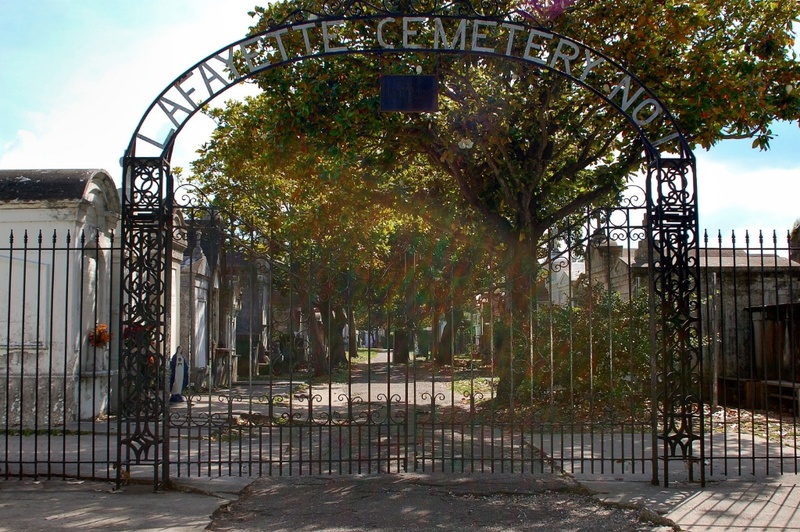 The Layfayette Cemetery No 1 is much smaller than the Metarie cemetery and the tombs are less elaborate. After an hour in this much smaller cemetery, Patrick and I had become separated and I found myself near the front gate. I could hear the chatter of people on the sidewalk outside the cemetery. I heard a man’s voice say, “Does that lady know she’s locked in?” I glanced up. “Hey, do you know you’re locked in?” he said to me. I responded with a half smile. He reached over and grabbed the bars of the gate and shook them – presumably to show me that he knew what he was talking about. “I am not even kidding,” he said. Uh-oh. I began walking up and down the paths until I found Patrick. “Hey, there may be a problem.” “Oh yeah? With what?” When I told him, he remembered that the cemetery was supposed to close at 3pm. It was a few minutes past. We went back to the gate and laughed with the people on the outside, and eyed the cast iron gate for footholds. I handed my phone through and one of them got a picture of me. Then suddenly, two tour guides showed up. And Viola! We climbed right out. Me, trapped in a cemetery. 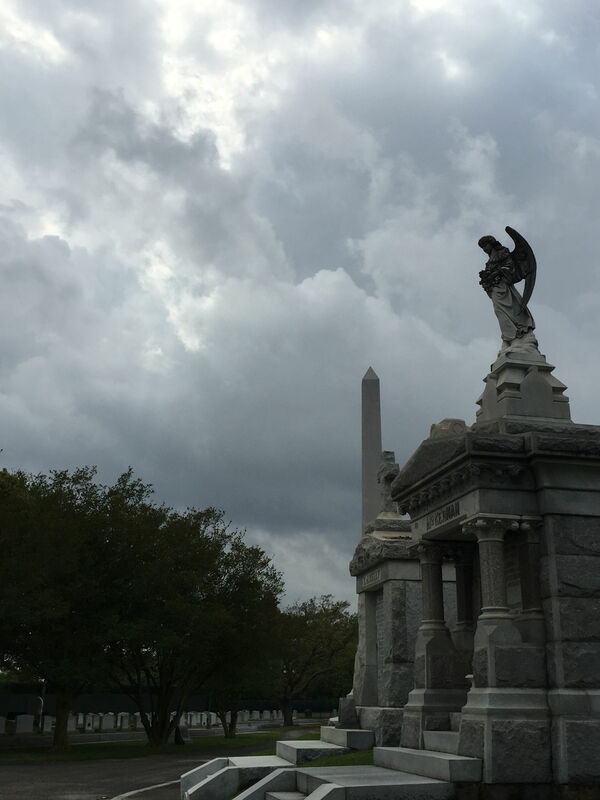 This image is from mikestravelguide.com where he wrote about free things to do in New Orleans. After that we went to the waterfront and walked along the river. I didn’t get any more decent photos, so I don’t have much more to show you. We took a lovely dinner cruise on a paddlewheeler Creole Queen down the Mississippi River and back again. It was warm and lovely and I was on a ship in the country’s longest river. Our view of the city in the sunset from the water was a pretty nice final scene for the day. New Orleans from the Mississippi River.